Bj Showing Jess that Barista Mag is not about hot coffee guys. 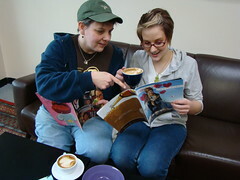 Jess and I sat down with a couple of copies of Barista Magazine and some tasty coffee. We had our photos taken for Barista Magazine's 5th anniversary issue. So we are looking forward to seeing which photo Sarah chooses to use. Stay tuned to see what wacky things we will be up to next.